Choosing beef that is naturally-raised and grass-fed is becoming increasingly important to discerning foodies. Grass-fed beef is generally considered leaner, more finely textured and nutritionally better for you. 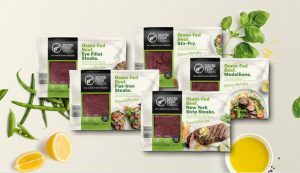 Silver Fern Farms are introducing New York Strip Steaks to their beef offering and showcasing fresh new packaging across their entire grass-fed beef range, leading the way in innovative retail packaging in both New Zealand and key export markets. Silver Fern Farms General Manager Marketing, Sharon Angus, says that producing products that today’s conscious consumers will appreciate is a key focus at Silver Fern Farms, both internationally and here at home. Angus says updates to the beef range, including product innovation, new packaging and creative cooking suggestions, reflect the confidence New Zealanders now bring to the table. pre-portioned into steaks ready to pop straight into the pan or onto the grill. “The way we’re eating is changing and so is the way we’re consuming red meat off the back of global trends and influences,” says Angus. “Food-lovers are better educated and more informed than ever and are looking for simple, new ways to share great-tasting, locally grown produce with family and friends. The new beef range is available this month at supermarkets nationwide.